Ten passenger airlines operate from STL, offering daily service to over 60 domestic and international destinations. STL is committed to the success of both existing routes and new routes by offering multiple benefit packages that provide incentives and marketing support. Establishing successful new passenger routes is a priority for STL. STL's passenger airlines provide service to more than 60 domestic and international destinations. Located in the population center of the United States, STL is situated in an ideal place for national and international commerce and travel. Beyond serving as the region's gateway, the Saint Louis metropolitan area is home to nearly 3 million residents. Additionally, STL serves another 3 million residents within a short two-hour drive (catchment area). 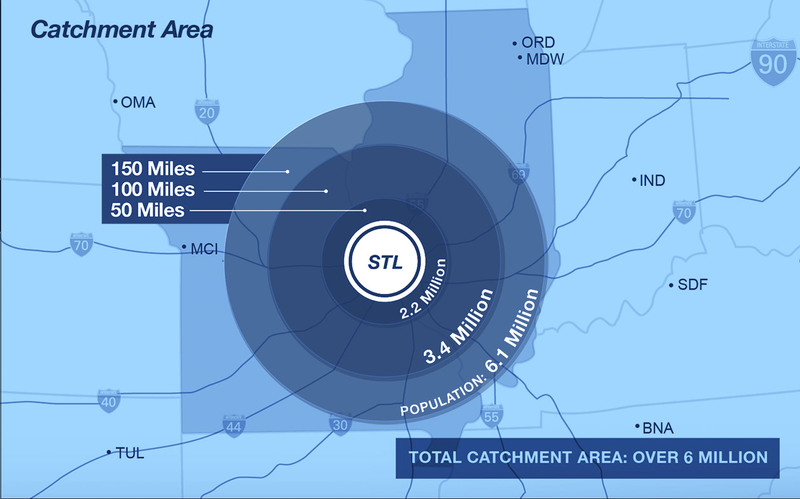 Airlines serving STL have access to STL’s far-reaching catchment area. No other major airport is within a four-hour drive from STL, giving it a non-competitive catchment area of over 6 million people. Click on the map to zoom in. One of the top 30 U.S. airports for domestic passengers served, STL provides service to over 13 million passengers a year. 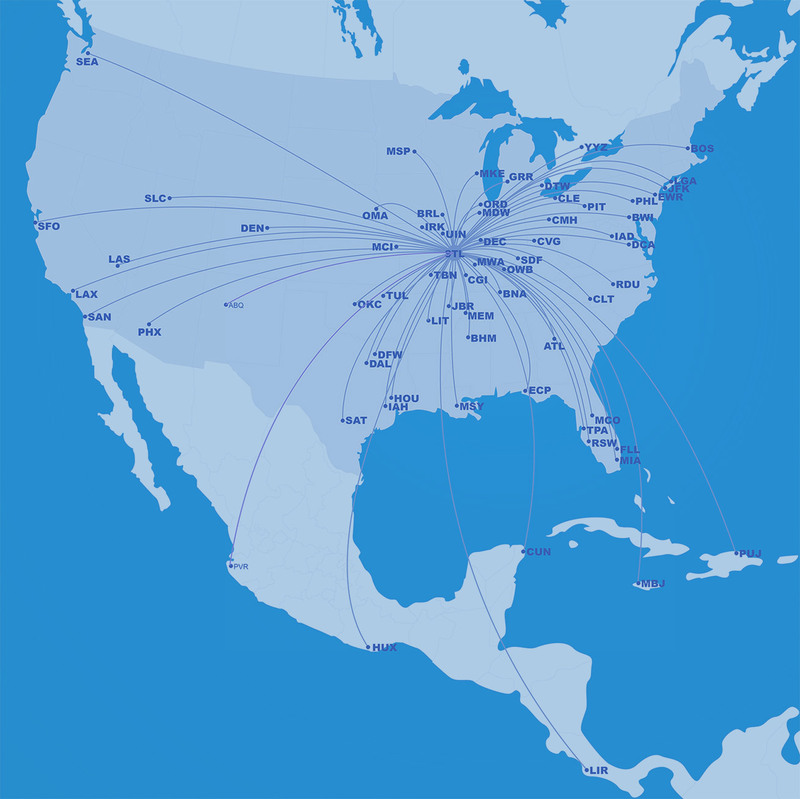 Ten airlines operate at STL, providing service to more than 60 domestic and international destinations. Click on the map to zoom in. STL is experiencing robust demand in both domestic and international markets. In fact, a number of international markets still lack available seats to accommodate demand, creating opportunities for airlines to take advantage of these capacity shortfalls. As part of its commitment to growing passenger air service, STL provides various incentive programs and market assistance to airlines. STL offers an Air Service Incentive Program that reduces new market start-up and operating costs for airlines that initiate or grow service. Additionally, a Marketing Support Program awards marketing funds to airlines that initiate or add service at STL, as well as eligible vacation packagers. These funds are intended solely for the promotion of each airline/packager's STL service and can be spent on a wide variety of media or activities.